Top: The Eno Collection of New York City Views, Coffee-House slip foot of Wall-Street, 1830. Retrieved from NYPL Digital Archive. Bottom: Moses King, King's Views of New York Stock Exchange, 1897, pg. 73. Wall Street began its commercial and financial development along the East River where port activity was focused. At the end of the 18th century docks lined Front Street, then the water's edge, and commodities of all kinds were unloaded to warehouses, while merchants traded the value of shipments on exchanges. The goods arriving to New York in the 1790s were registered at the coffee houses on Wall Street and included coffee, tea, sugar and molasses, fine furniture, cloth, cotton, and enslaved men, women, and children. The custom of drinking coffee had been introduced during the Dutch Period, but it was after the English take over of New York, the British manners of tea and coffee drinking became a social activity. Coupled with the need for public assembly spaces where news could be shared, coffee houses soon became centers of the business and political life of the city. The Tontine Coffee House was organized by a group of 24 prominent brokers and merchants who had entered into an exclusive trade agreement on a common-commission basis, creating the Tontine Association. 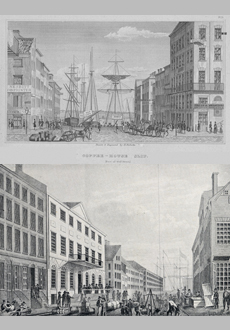 Rivaling the older Merchants Coffee House located diagonally on the southeast corner of Wall and Water streets, the Tontine became the premiere meeting place for New York's wealthy merchants after a fire destroyed the Merchants Coffee House in 1804. The New York Stock Exchange traces its origins to the Tontine, where early trading of the New York Stock & Exchange Board took place until relocation to the moved Merchants Exchange at 55 Wall Street in 1817.